Hiya guys! I don't know about you, but for me love is in the air! Or maybe I just had way too much early heart-shaped chocolates this weekend. Spoiler alert, I totally did haha. Remember guys, judgement free zone here. But as you can probably tell I'm continuing on with the Valentine's trend and today I am sharing the Valentine's Day trio by CDB Lacquer. Let's have the swatches do the talking! The Valentine's Day trio by CDB Lacquer only be sold in pre-order form starting on Friday, January 22nd. Each polish will retail for $8.50 each and will be available as a full-size trio for $24. All Valentines polish orders will receive a small baggie of Heart glitters in numerous colors in their order. Burning Desire can be described as a glitter-bomb that consist of pink, red, white, silver and gold micro glitters. I always forget how much I enjoy a full-coverage glitter polish like this until I actually put it on. You can definitely pair this over a base coat for a different kind of look as well. The formula has a nice smooth application as expected from CDBL. As expected it is gritty when dry and will need double topcoat in order to have a smooth finish. Shown here is two coats and sealed with a thick layer of glossy topcoat. Love Letters can be described a white crelly with red, pink and purple glitters in numerous sizes. Considering the lightness of the shade I was not expecting it to be so opaque. The formula is fantastic, super smooth and self levels perfectly. It does end up drying a bit on the gritty side due to the over glittery consistency, but doubling up on the topcoat smooths it down. Shown here is two coats and sealed with a thick layer of glossy topcoat. Adore can be described a dark pink to lighter pink thermal with red, pink and silver glitters in numerous sizes. The consistency has a great balance between thin and thick, easily gliding off the brush. Formula is good, not too sheer but does require more than a single coat for am opaque finish. The color transition is triggered easily, but the photos don't do justice to the warm state. It is initially lighter when triggered by warmth. The tiny red glitters like to clump together, but the brush is able to easily disperse them around the nail. Needless to say, it is a super glitter packed polish so the finish ends up being gritty on its own.Shown here is two coats and sealed with a thick layer of glossy topcoat. 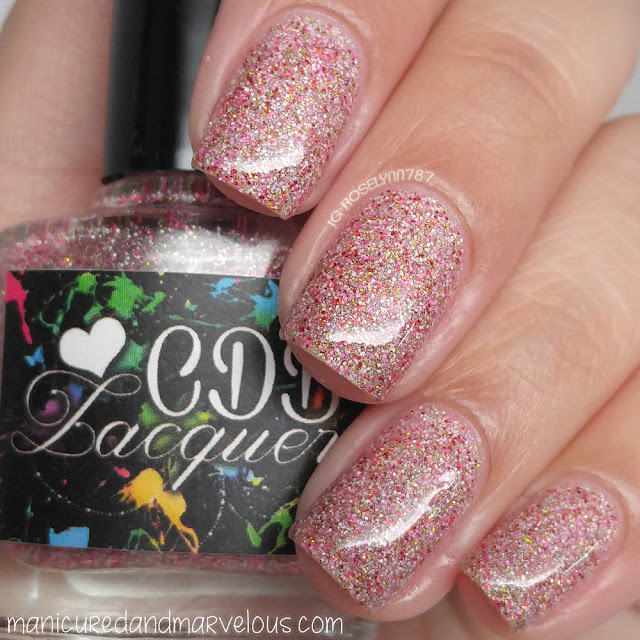 Overall the Valentine's Day trio by CDB Lacquer hits cupid straight in the heart. All three polishes are absolutely gorgeous and versatile for year round wear. Not going to lie, it's super hard to pick a favorite here. But when it comes down to it I cannot resist a white crelly so my must-have from this trio would be Love Letters. But what about you guys, which one is your favorite? 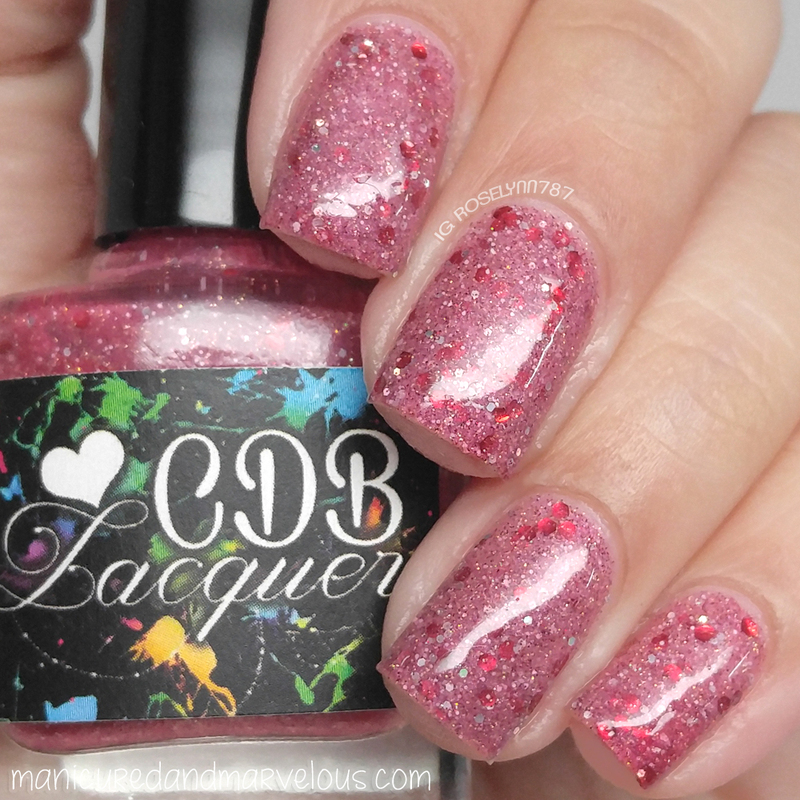 The Valentine's Day trio by CDB Lacquer only be sold in pre-order form starting on Friday, January 22nd. Each polish will retail for $8.50 each and will be available as a full-size trio for $24. Thank you so much for the gorgeous photos and great review! I'm so glad you enjoyed them!! I love all three, but I think my favorite is Burning Desire! What top coat do you use? It really glosses those glitters up beautifully!!! How pretty! I'm not a huge fan of thermals, but I really like Adore! Such a pretty trio. I really like Love Letters. I am in love with all of these! Amazing swatches as always. These are stunning on you! I adore Love Letters, and that thermal is incredible. Love Letters is beautiful! Digging the new bottles too. These are all lovely, but I think I like Adore best! Adore is so cool looking! Woah! All of them are pretty but I adore Burning Desire the most! Love Letters is so darn cute! Amazing! Burning Desire is my favorite! Each of these are fantastic! Gosh they are all so pretty! I've probably said this before but I love your midi ring.